Having enjoyed our detour down Rodney Street, we thought we'd take a look at the Gothic Anglican Cathedral, which is futuristic by Dr Moss's guide book's standards, having been built between 1904 and 1978. 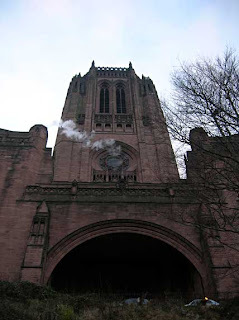 You can see from what an imposing edifice it is (it was freezing cold and getting towards dusk when I took the photograph above, and the steam issuing out looked especially eerie). 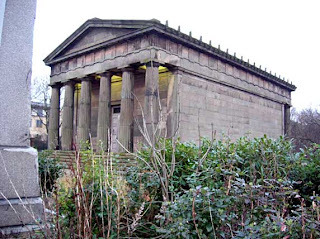 What we particularly wanted to see was The Oratory (below), which stands at the front of the cathedral, beside the descending pathway into St James's Cemetary. This is the cemetary's former chapel; its purpose was to accommodate funeral services prior to actual burial, and it also housed monuments to the dead. 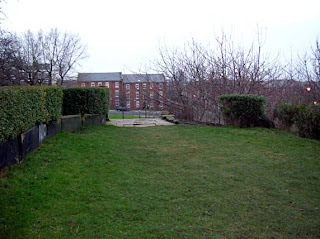 It was designed by John Foster (1786-1846) in the Greek Revival style, though sadly, the burial ground has since been abandoned, as you can see from the undergrowth. We couldn't get near it because it's fenced off, but you can view the interior on appointment. After a look around the graveyard, we emerged up the other side of what's known as St James's Mount, a ridge overlooking the city. We were just about to leave when my boyfriend spotted a little grassy area which caused him to pause and flick through Dr Moss's guide (below). We'd come across St James' Walk: an area developed in 1779 as a place of fashionable amusement. 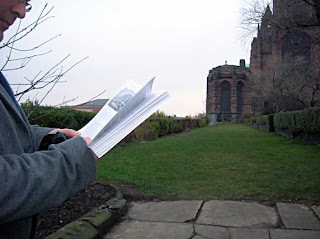 It was half-covered in undergrowth (not to mention the cathedral itself, which, as you can see from the picture below, was built partially on top of it), but the pathways were unmistakeable. Here we are standing at the entrance to the walk, which Dr Moss describes as: 'a gravelled terrace, 400 yards long. It has been compared to the terrace at Windsor. From hence we have a very extensive prospect, across the Mersey, of the north part of Cheshire'. The view is still pretty splendid today, though clearly not as extensive. Moss adds that you were obliged to enter on foot because a horse-block was placed near the entrance. 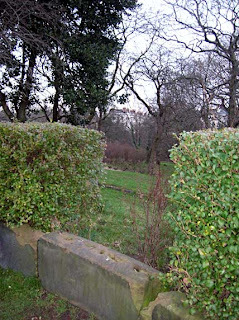 A glimpse through a gap in the hedge (below) revealed tree-lined walks reminiscent of the pleasure gardens of the 18th century. We were pretty excited by the discovery of this 'engaging spot' and the knowledge that this is probably the closest we'll get to visiting Vauxhall or Ranelagh, though of course, St James's Walk wouldn't have quite been on the same scale! This is the end of our formal tour, but as some of the buildings were so interesting (I haven't even mentioned the Lyceum and the Catholic Church, which is now the Alma de Cuba nightclub) I plan to do a couple of isolated posts on them. 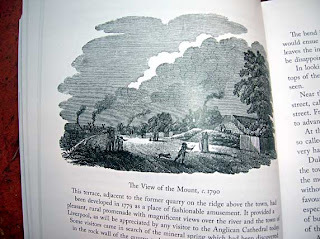 Hope you enjoyed our guide to Georgian Liverpool in the year 1797. Hello Mrs. Woffington, I did enjoy the tour and the lovely green and grey photographs. Your Mr. is intent on studying his book while you ponder nature and history. I do so love memoirs!